Although the Kona Electric shows Hyundai is far from complacent when it comes to electric vehicles, it sees battery power as a stepping stone; a component of replacing fossil fuels rather than the only solution. Its longer-term goal is hydrogen fuel cells, bypassing some of the materials-sourcing issues of building batteries, and offering a more familiar experience for end-users. It’s easy to see why; fuel cells make their own electricity, offering hundreds of kilometres of range with short refuelling stops and only water coming out of the tailpipe. The Nexo is another step towards making it mainstream, with cost-parity with diesel expected as soon as 2025. These are not new ambitions. Hyundai launched its first series-produced ix35 Fuel Cell in 2014, and claims to have a 70% share of Europe’s FCEV market – most of those will be on fleets, too. Volumes were small, but it’s an important car. Pioneering FCEV drivers have generated real-world experience that’s underpinning development, and created demand for fuelling stations too. But the Nexo was developed from a blank sheet. It’s on a bespoke platform and uses a smaller, lighter fuel cell stack with more space-efficient packaging of the tanks. Significantly, it’s also available in right-hand drive. This also means taking a step up in size, now similar overall to an Audi Q5. Not just to cash in on unending demand for SUVs, but because there’s a packaging advantage for doing so. It seats five, unlike the Toyota Mirai, offering a Tucson-sized boot extended over flat-folding rear seats. Retractable door handles aside (think Jaguar I-Pace), it could be a version of the Santa Fe. This is also true inside. Despite the ‘vegan leather’ and eco fibre upholstery, it has few complications to adjust to. And while the over-buttoned dashboard looks a bit like a Nineties hi-fi system, most of the controls are logically grouped and easier to find than some touchscreen-operated setups. Menus can be navigated using a rotary dial, and it’s Android Auto and Apple CarPlay compatible too. It’s ordinariness that covers what is quite an extraordinary process underneath. The Nexo feels like a large electric SUV, with barely any wind or road noise and the usual gearless, silent acceleration you’d expect from a motor. But what’s happening is very different. Fuel cell vehicles essentially perform a reversal of electrolysis; combining oxygen from the air with compressed hydrogen from the car, to produce electricity and water. The upshot is, it’s filtering 99.9% of fine dust out of the air as it drives, at twice the rate diesel cars produce it, Hyundai says. The challenge, of course, is this is still a market at the ‘early adopter’ phase. Fuel cell vehicles rely on dedicated refuelling infrastructure that’s still sparse in Europe, and there are questions around making hydrogen greener to produce – though this is happening. 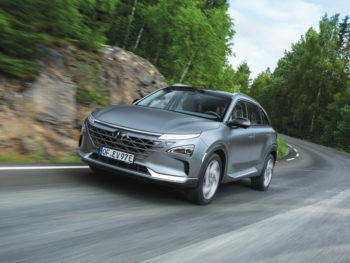 But the Nexo opens fuel cells up to an even broader set of end-users than the ix35, and it’s an important next step towards hydrogen becoming a part of the fuel mix. The Hyundai Nexo is an important, if not mainstream, newcomer. In part because it makes an extraordinary process feel so totally ordinary on the road.